- Wish to chase steelhead on the fly? We offer fly tackle trips as well all winter long! - Visit the Reports & Pix Page or visit us on Facebook to see recent catches! - Visit the Sol Duc Wild Steelhead Enhancement Project Page to see how local guides, businesses, and residents are working to preserve the wild stocks! 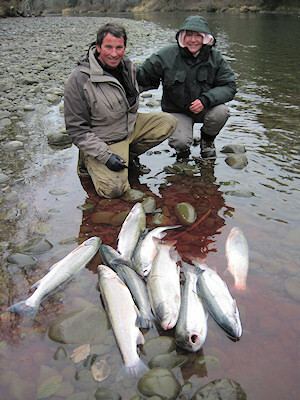 - Visit our Gallery Pages to see lots more photos of Olympic Peninsula steelhead fishing! On Washington's Olympic Peninsula, mid-November means more than just getting ready for a big turkey dinner at Mom's ... it means that the long wait for the arrival of the winter steelhead fishing season is over. Beginning around the second week November, the first of the hatchery-origin steelhead return to the Forks, Washington area rivers. 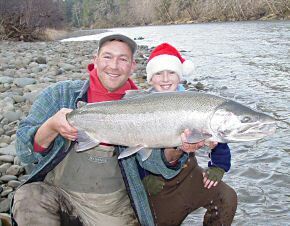 The hatchery steelhead run peaks around mid-December and tapers off in early to mid-January. It is at this time that the first of the beloved native, or wild steelhead begin to show in good numbers in the region's rivers. 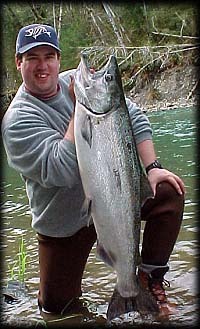 Limits of Olympic Peninsula hatchery steelhead. Most anglers choose to harvest their daily limit of hatchery steelhead with a current limit of three fish daily. The wild steelhead are what make the Forks, Washington area rivers world-famous! Natives typical average around 10-12 pounds with 20 pound class fish making frequent showings. Every year, there are a few lucky anglers that catch steelhead in excess of thirty pounds! In fact, steelhead as large as 38 pounds have been taken in the tribal nets! The largest sport-caught fish we've seen was a released buck of over 45 inches in length that weighed approximately 34.5 pounds. Although not required by law in all stretches of the Peninsula rivers, we are proud to say that we operate under a strict catch-and-release policy on wild steelhead stocks. Christmas time monster ... a photo of Claire and her giant chrome cruiser adorned the cover of an issue of Salmon, Trout, Steelheader magazine. These are arguably the greatest of all freshwater gamefish and we are committed to do what we can to help preserve these runs of giant migratory rainbows. And if you do catch a trophy ... we ALWAYS keep a nice camera and tape measure on board for pictures and measurements for a reproduction mount ... the reproductions are less expensive and last longer than most skin mounts anyhow; and as catch-and-release has become more popular, the quality of available reproductions has risen to that of even the finest skin-mounts! Late season steelhead anglers plying the waters of the Sol Duc River sometimes encounter high-speed silver submarines known as spring chinook. Arguably the hardest fighting of all Pacific salmon and certainly one of the best-eating, we affectionately refer to these hatchery-origin fish as 'salmo barbequeus'. April bonus! A spring chinook sweetens a day of wild steelhead fishing. We service both the conventional tackle and fly angler. If you have a preferred style of steelhead fishing, we will be happy to accommodate your preferences - or leave it up to us and we'll match our tactics with the water that we're fishing.